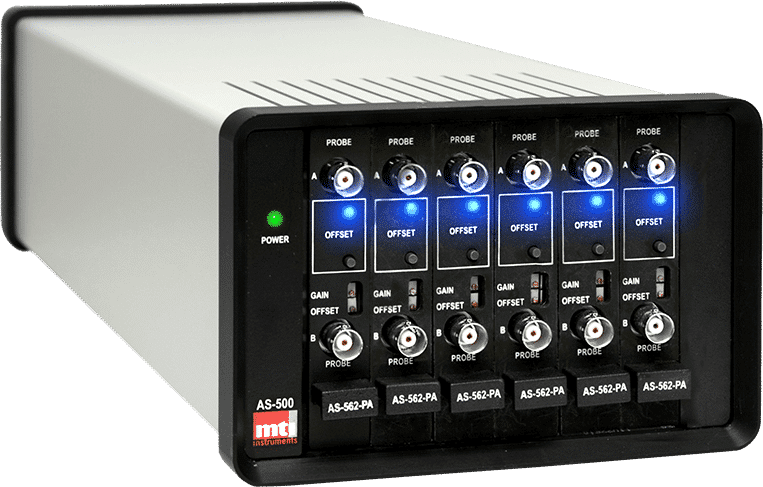 The Accumeasure TM 500 compact multi channel capacitance rack system accepts up to 6 capacitance amplifiers. Capacitance sensors are used to measure position, thickness, dynamic motion, vibration, run-out of conductive and semi-conducting materials where high resolution and accuracy of up to sub nanometer are required. Select from the standard AS-563 (for grounded targets) or the proprietary push/pull AS-562 (ungrounded targets) in any combination. The modular design allows customers to populate the rack with their required number of measurement channels for thickness or single ended displacement measurements. Compact by design, the Accumeasure TM 500 capacitve sensing sensor is ideal for in vehicle testing of brake rotors, axle runout, or thermal expansion testing using the DC model. Multiple racks may be synchronized together for multichannel operation on a common surface to avoid inter-channel interference.